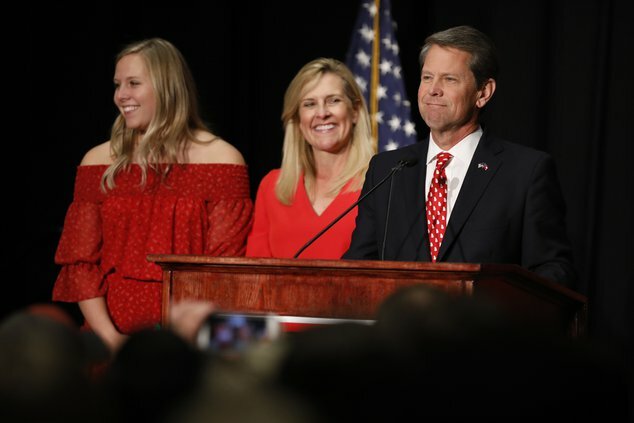 Updated: Nov. 7, 2018, 11:45 p.m.
Republican Brian Kemp’s campaign declared victory Wednesday in the Georgia governor’s race, though Democrat Stacey Abrams insists that enough ballots remain to leave open the possibility of a runoff. Ryan Mahoney, a top Kemp campaign adviser, told reporters in a conference call that the numbers show Abrams can’t win and a runoff won’t happen. Mahoney say Kemp is certain of victory and preparing to take office in January. 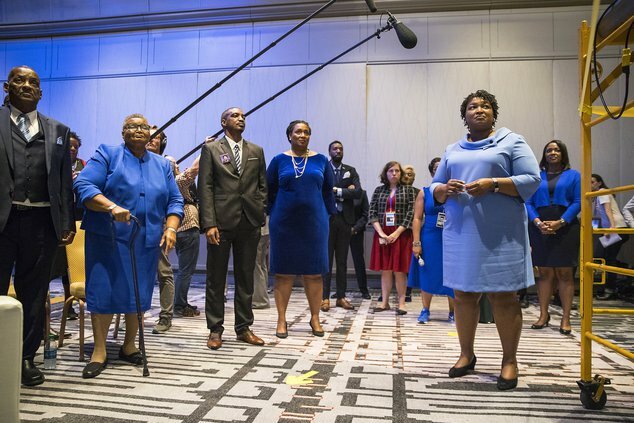 The move comes after a tense standoff that leaves open the possibility of litigation, as Abrams’ campaign spent the day pushing for the continued counting of absentee, mail-in and provisional ballots and renewing its concerns that Kemp remains the chief elections officer supervising his own election. With 100 percent of precincts reporting as of 6 p.m. Nov. 7. In a conference call with reporters Wednesday evening, Abrams’ campaign manager Lauren Groh-Wargo made it clear the campaign was not giving up and did not recognize Kemp’s self-proclaimed victory. “We are here tonight to say that we do not accept that,” Groh-Wargo said. The Abrams campaign said Kemp’s camp did not notify it of his intent to declare himself the victor, and was withholding what should be public information, including the actual number of outstanding provisional ballots. “He is using the secretary of state’s office as an arm of his campaign apparatus,” Groh-Wargo said. Abrams campaign chair Allegra Lawrence Hardy detailed a robust legal team preparing for litigation. The attorneys are “looking at all options,” Hardy said. The Abrams campaign is focused on finding enough votes to force a recount or a runoff against Kemp, which the team believes it can win. Finding out how many ballots remain uncounted is at the core of that strategy. “They deserve to be counted before the secretary of state crowns himself governor,” Groh-Wargo said. The Abrams camp was also concerned with absentee ballots expected from counties affected by Hurricane Michael, saying some mail from the Albany area had been routed through Tallahassee due to storm damage. Carl Cavalli, a professor of political science at the University of North Georgia, said voters may have mailed in their ballots due to a variety of factors, such as long lines at polling places and a perception that voting machines may be unreliable. Forecasted severe weather on Election Day could have also driven voters to send in their ballots instead, he said. Many of the outstanding ballots are in the metro Atlanta area, a region that has seen high turnout for Abrams. In Gwinnett County, Abrams won with 56 percent of the vote. In DeKalb County, she received 83 percent of votes. That shift to the left, which some call the “blue wave,” did not make its way north to Hall County, where Kemp got 73 percent of the vote. Cavalli also noted that U.S. Rep. Doug Collins, R-Gainesville, held strong in the conservative 9th District, getting almost 80 percent of the vote. Increasing diversity, particularly with a growing Hispanic population, may shift the vote in the future, though, Cavalli said. State law gives counties until Tuesday to complete vote counts and certify results to state elections officials. The statewide certification must follow by Nov. 20. But confusion also surrounded that timetable, with a release from the Secretary of State’s office saying the election would be certified “no later than Wednesday, November 14,” while Groh-Wargo maintained that counties must certify by Monday, which is a federal holiday. The indefinite extension in Georgia focuses a spotlight on a race that already has drawn massive investments of time, money and star power — from President Donald Trump and former President Barack Obama to media icon Oprah Winfrey. Cavalli said that both Republicans and Democrats can thank Trump for high turnout in the election. Times reporter Megan Reed and news editor Nate McCullough contributed to this report.